Congratulations to Colonel Spencer Clouatre and family on his promotion! 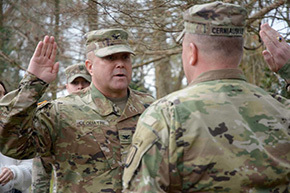 COL Chris Cerniauskas '93 did his promotion. He is a longtime friend of the family. Also at the promotion was COL(R) Larry Horacek '70, who introduced COL Clouatre to West Point as an idea when he was a SGT in Louisiana National Guard. COL Horacek is also Caleb Clouatre's '20 50-year affiliate class. COL Clouatre graduated right in the middle as class of '95.